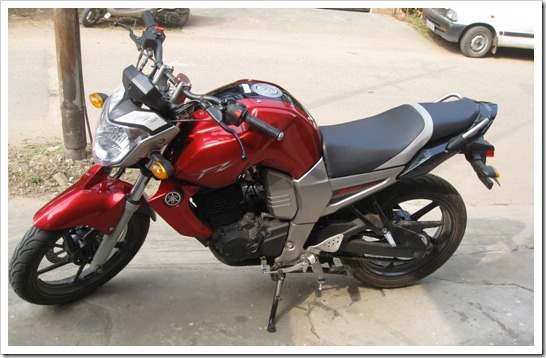 Blogging and Google AdSense brought us this bike – Yamaha FZ16. With earnings of past few months we purchased this bike a week ago. Thanks to the readers of this Blog and Google AdSense. Yamaha FZ 16 is the one of the hot selling Indian bikes and the average wait time for delivery of the bike after booking is 3-5 weeks time. You can download the wallpapers of Yamaha FZ 16 bike from here and read the review here. Very informative post. Yamaha FZ looks best in terms of design. I dont like the colors of FZ-S. They are so odd!! Yamaha fz16…..Yamaha fz16 is a macho street fighter. Yamaha RFz16 is inspired awesome funky looks and tremendous power. Just one look at the bike is enough to make you fall for it. Yamaha Fz16 surely is one of the best looking naked bike in its class with its macho and muscular looks. The macho tank, aggressive front heavy stance and the rear embody with street fighter looks will make you fall for it. Look at the awards won by Yamaha FZ 16 here http://www.yamaha-motor-india.com/Awards_photogallery/flash_photogallery.html. Am confused abt dis bike!! is it really gr8 as its bein mentioned???? hi,,,,,,,I am an owner of bike fz16 and am really enjoying the riding its really a lord of streets and i am getting 42 plus kmpl in the city is thr any way to have more then this…..
hi, im an owner of fz16 and i thinkits an awesome machine but i’m not getting enough of it as i m a novice so lpz give me tips to get the best of this beast. Congrats buddy, that bike looks really stylish. I am also planning to dump my old bike (Discover DTSI) for this one. That is very kind of you. Special thanks for being a regular visitor of our blog. That’s a great bike !!! Yamaha FZ 16 is one among the great bikes available in the market. The joy of riding the bike is amazing. Thank you very much bagga.